The family of an Indian ex-navy officer facing a death sentence for spying in Pakistan has been allowed to visit him. The mother and wife of Kulbhushan Jadhav met him in Islamabad on Monday, amid arguments between the two countries over his conviction. Pakistan said he was arrested in Balochistan in 2016 and it has produced videos that it says are confessions. India has argued that he was kidnapped by Pakistan while he was in Iran and has been tried on "concocted charges". Kulbhushan Jadhav's mother, Avanti, and his wife, Chetankul, were accompanied by Indian diplomats during the visit, which lasted 40 minutes. The family met him at the Pakistani foreign ministry in Islamabad and were scheduled to take a flight back to Delhi in the evening. BBC Hindi's Shumaila Jaffery in Islamabad says the women were brought to the Pakistani foreign office building amid tight security. "Both women looked very serious. They didn't say anything despite journalists shouting questions at them. They quietly walked towards the building," our correspondent adds. Pakistani foreign office spokesman Mohammad Faisal said that the meeting with Jadhav, whom he called a "terrorist" and a "saboteur", was allowed on "humanitarian grounds". He said that Kulbushan Jadhav had admitted playing a role in assassinations in Pakistan and supporting attacks on military installations. 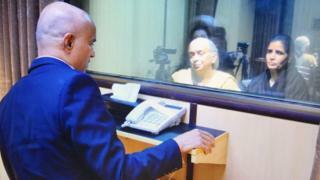 The two countries are also fighting a legal case over Jadhav at the International Court of Justice (ICJ) in The Hague. In May, the ICJ ordered Pakistan not to execute him until it had time to hear the case brought by India. There have been differing accounts of how and where he was detained. Pakistan says he was arrested on 3 March 2016 in its restive Balochistan province. The area has been hit by a separatist insurgency, which the Pakistani government accuses India of backing. India says he was kidnapped by Pakistan while he was in Iran. The nuclear-armed neighbours have a long history of diplomatic rows, and the two governments often accuse each other of sending spies into their territories. In November last year, Pakistan withdrew six officials from its mission in Delhi when India accused them of being spies. It later leaked to the press the names and photos of eight alleged Indian spies working at India's mission in Islamabad. However, executions for spying are rare. In 1999, Pakistan hanged Sheikh Shamim 10 years after convicting him of spying. Sarabjit Singh died in prison in Pakistan in 2013 after more than 20 years on death row. Officials said he was attacked by other prisoners.